Pre-heat the oven to 180°C/360°F. Transfer some of the eggs to a large saucepan of salted water and cook for approx. 8 min. Distribute prosciutto over a baking sheet lined with paper towel, then cover with paper towel and another baking sheet. Bake at 180°C/360°F for approx. 5 min., or until crispy. Remove cooked eggs from the pot and transfer them to an ice bath until cool enough to handle. Transfer eggs onto a cutting board and carefully remove the shells. Wash off any shell residue in the ice bath. Halve eggs and carefully scoop out the egg yolk. Add the remaining raw egg and equal parts of boiled egg yolk and egg white together with mustard to a liquid measuring cup and blend. Slowly add oil while blending. Transfer the mayonnaise to a small bowl and season to taste with salt and pepper. Set aside until serving. Halve avocados and remove pits. Scoop out the avocado flesh and transfer to a liquid measuring cup. Halve limes and trim chili. Add chili to avocados and juice limes directly into the measuring cup. Add cilantro, salt, pepper, and olive oil. Blend and fill into a piping bag with decorating tip. Remove prosciutto from the oven and transfer to a plate. Chop parsley. Spread mayonnaise on a serving plate. Top with boiled egg halves and fill with avocado cream. 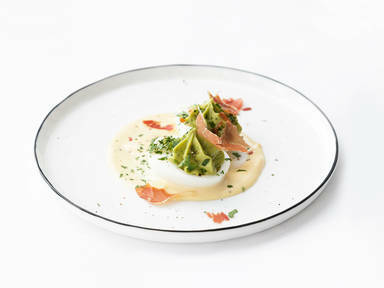 Distribute prosciutto on plate and garnish with parsley. Season to taste with salt and pepper. Enjoy!